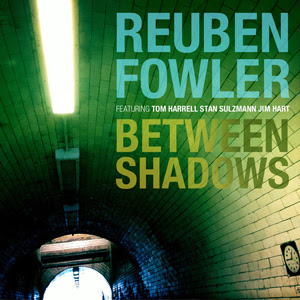 Reuben Fowler was the second winner of the Kenny Wheeler Award (2012), and there are discernible traces of the great Canadian’s warblingly lyrical trumpet/flugelhorn style in the younger man’s playing, but this debut album also showcases a highly developed compositional gift that accounts for the presence on it of another major Fowler influence, US trumpeter Tom Harrell, one of the UK’s most respected composer/leaders, Stan Sulzmann, vibes player Jim Hart and yet another stellar trumpeter, Guy Barker (who conducts the album’s eight pieces). Such widespread peer-group enthusiasm and support is rendered immediately understandable by the very first piece on Between Shadows: ‘Too Minor’, its brisk, confident chatter of carefully deployed brass and reeds set skilfully against the light but vigorous buoyancy of the rhythm section, is an arresting opener accommodating absorbing solos from pianist Matt Robinson, flugelhorn player Percy Pursglove and altoist Sam Mayne. Thereafter, whether providing his 20+-piece band with affecting brass chorales (‘Introduction to Holness’); gentle but insistent, almost folk-ish lilts (‘Holness’); skipping themes hardening into churning vigour (‘The Lost’); stately pieces with swooning vocals (‘The Lost and Found’); or decorating the familiar air ‘A Nightingale Sang in Berkeley Square’ with the sweet shriek of brass, Fowler consistently justifies the excitement surrounding his sudden emergence as an ambitious, all-round instrumental and compositional talent. Rich and varied, classy and poised, its beguiling mix of power and delicacy firmly rooted in the big-band tradition running from Gil Evans through the likes of Mike Gibbs and Maria Schneider, Between Shadows is that rare bird, a genuinely mature and polished debut.